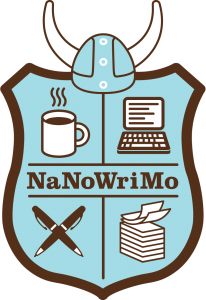 In November 2016 I took part in NaNoWriMo, the National Novel Writing Month. You commit yourself to write 50,000 words during the month of November, a major effort alongside travelling and other work. However, I had a lot of train journeys, which helped. 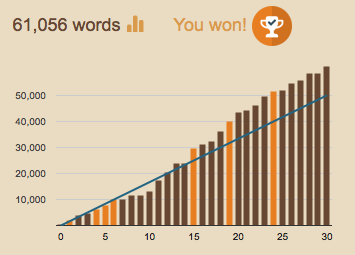 In the end I averaged 2000 words a day, 61,056 in total, and this nascent novel is 2/3 complete. I have signed up for NaNoWriMo 2017, and hope to complete it this November, but until then, some samples below, see the menu for longer excerpts. All I remember at first were the eyes, steel blue, I had never seen eyes that colour before. Shocked, a little scared, innocent. His sun-shot hair was all but transparent against the sky, and I could almost count the sea spray on the shoulders of his grey trench coat, each drop balanced on a single woolly fibre, tiny lenses catching the sunlight as if he were part of the sun, part of the sky, like the morning dawn road glittering out to the east. How long had he been there, how long had I.
I could not speak, the enfolding silence was too strong the weight of sea-breeze and surf filling my head, too far inside, buried too deep. An idle thread of my mind dwelt on the curious beauty of the moment, but somewhere else, deeper still that I did not dare to touch, I felt again that silent scream, and with all that was left of me willed my eyes to say, “help, please”. The next thing I remember was Aunt Mary’s face, only it was mixed up with the other face, when the blanket had moved there was something else as well as the dirty hair. It was no wonder I’d fainted she said, her voice very matter of fact. I’d not had proper food since dinner-time yesterday, and I’d been up all night. She was going to take me home, get some food inside me and put me to bed. We cannot see inside anyone, even someone as close as Neil was to me, but I think now I understand a little more. There was a grief for Orla herself, or perhaps more all the dreams and hopes she represented, and the knowing that whatever future imaginings he had they could be shattered as suddenly and easily. There was also a grief for the distance between Father and he, a grief that would be with him in different ways the rest of his life. Finally, I think, there was a grief for lost childhood. The sun must have been behind a cloud, for suddenly there was a brightness, and I saw my shadow in the doorway, stretching out towards him. His eyes opened, a look of beatific joy on his face. I can only imagine that the sunlight made a halo around my head and he found himself facing an unlikely angel. “It’s you”, he said, “so beautiful”, before his head slumped down again, and to this day I do not know whom he saw. From the Sea (Calum's Child) by Alan Dix. Copyright © Alan Dix 2019.